Do you already have a cabinet installed? No worries !! 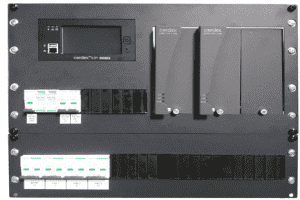 !Our comprehensive standalone range of products can be customised in 19” Rack Mount. 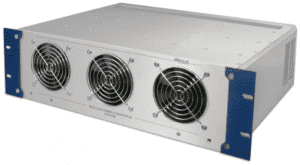 2.2kW 110 VDC float Charger (Two 1.1kW Hot Swappable rectifiers). Fully programmable touch screen controller. 6U Sub Rack Charger and 3U DC distribution for 19” rail mounting. Single Phase 230VAC input protected by surge protection monitored by the system. 40A 2 pole Battery Breaker. DC distribution of 3 x 10A 2 pole MCB’s. Programmable alarms with 6 alarm relay outputs. This rugged, industrial quality DC/DC converter uses field-proven topology to generate the required output power. 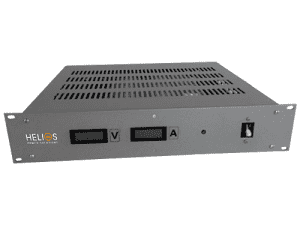 It is built with seven BAP 65 internal modules. Cooling is via built-in fans. Low component count, large design headrooms, and the use of components with established reliability result in a high MTBF. It is manufactured at our plant under strict quality control. BAP5K converter has a special adjustable output. Input 240 VAC and Output 110 VDC. AC input and DC output on Phoenix connector on rear panel. Input Circuit Breaker mains power ON/OFF. Front Panel Voltage and Current Digital Meters. 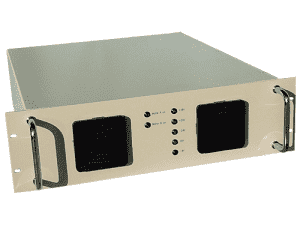 Special power supply assembly combines two high power 48V 5KW power supplies, all in a 3U x 19 in rack assembly with LED’S and various alarms.